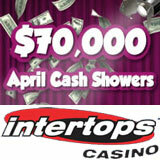 Intertops Casino is giving away $70,000 in casino bonuses during its April Cash Showers event and, as usual, players at every budget level have a chance to win. Just by playing any of the 300 casino games at Intertops, players automatically earn points and are ranked in six levels based on their deposits, wins and losses. Every month the casino, known for generous bonusing, gives away tens of thousands in casino bonuses divided amongst players at all six levels. Six random draws on May 3rd (one for each points level) will award great prizes, including 3x $1000 in cash. Players can accumulate points right up until midnight May 2nd and can see their current points and ranking any time on the online scoreboard. It’s a great time to visit Intertops Casino since two new slots games from RTG have just been added to the premier online casino’s already amazing selection of online slots and casino games. Builder Beaver and The Three Stooges II are both part of RTG’s “Real” series which features random major and minor jackpots. Builder Beaver is an animated video slot game featuring hard-working beavers. The Beaver Feature is activated by three or more Beaver symbols and gives 12 free spins with triple payouts. Three or more Scatters trigger the Sign Feature which gives 10 free spins and doubles winnings. The Three Stooges II is a classic three reel, three pay line slot game featuring Curly, Larry and Moe in video clips from their movies. It has launched just in time for the premiere of the Farrelly brothers’ Three Stooges Movie later this month. Ever since it took the world’s first online wager in 1998, Intertops has worked hard every single day to earn its reputation as one of the most trusted online casinos, sportsbooks and poker rooms in the world.